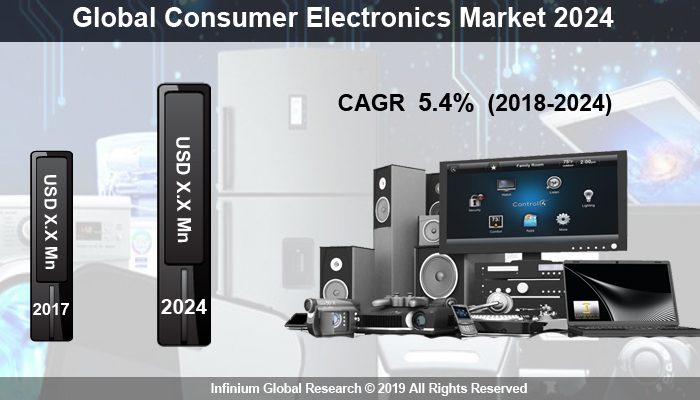 A recent report published by Infinium Global Research on consumer electronics market provides in-depth analysis of segments and sub-segments in the global as well as regional consumer electronics market. The study also highlights the impact of drivers, restraints, and macro indicators on the global and regional consumer electronics market over the short term as well as long term. The report is a comprehensive presentation of trends, forecast and dollar values of the global consumer electronics market. According to the report, the global consumer electronics market is projected to grow at a CAGR of 5.4% over the forecast period of 2018-2024. The consumer electronics is the term used to describe the electronic devices that are primarily designed to use for daily and non-commercial applications. This equipment includes a broad set of electronic devices including communications devices, entertainment, and other household devices. Consumer electronics continues in its trend of integration of new and advanced technologies with the electronics equipment. These consumer electronic appliances are created people's lives easier and more efficient. They provide several benefits including time-saving, increased convenience, easy to use, portability and others. The rapidly growing introduction of IoT in consumer electronics is driving the growth of the consumer electronics market worldwide. The connectivity of devices to the cloud enables reliable interconnectivity in consumer electronics. Additionally, the benefits offered by consumer electronics are contributing to the growth of the consumer electronics market. The rapidly changing lifestyles of consumers led to increased spending on the electronics equipment’s are expected to escalate the growth of the consumer electronics market. Also, the declining prices of the consumer electronic equipment’s are also favoring market growth. However, Moreover, the factors such as changing preferences, high demand for smart technologies in the household applications and rising disposable income are anticipated to create a huge demand for consumer electronics in upcoming years. The trending smart home conception is projected to create several growth opportunities in this market. Among the geographies, Asia Pacific is the dominating and the fastest growing region in the consumer electronics market. The trending advancements in the electronics equipment are the primary factor that drives the growth of the consumer electronics market in the Asia Pacific region. Additionally, high demand for smartphones and TVs frown the Asian countries are contributing to the growth of consumer electronics in this region. The factors such as growing disposable income, technological advancements, availability of different products and changing lifestyle preference are the expected to fuel the demand of consumer electronics in the Asia Pacific region. The report on global consumer electronics market covers segments such as product, and end user. On the basis of product, the sub-markets include washing machines, refrigerators, television, smartphone, digital cameras, hard disk drives, and others. On the basis of the end user, the sub-markets include commercial, and residential. The report provides profiles of the companies in the market such as SAMSUNG, Hewlett Packard Enterprise Development LP, Panasonic Corporation, Koninklijke Philips N.V., Nikon Corporation, Apple Inc., LG, Sony Corporation, Canon Inc., and Dell. The report provides deep insights into the demand forecasts, market trends, and micro and macro indicators. In addition, this report provides insights into the factors that are driving and restraining the growth in this market. Moreover, The IGR-Growth Matrix analysis given in the report brings an insight into the investment areas that existing or new market players can consider. The report provides insights into the market using analytical tools such as Porter's five forces analysis and DRO analysis of consumer electronics market. Moreover, the study highlights current market trends and provides forecast from 2018-2024. We also have highlighted future trends in the market that will affect the demand during the forecast period. Moreover, the competitive analysis given in each regional market brings an insight into the market share of the leading players.